The unique key design is available in your choice of almost 9000 color combinations. BiLock is the only one that is bump and virtually pick proof. Rekey your own locks when you lose a key. Rekey your own locks when you fire an employee. 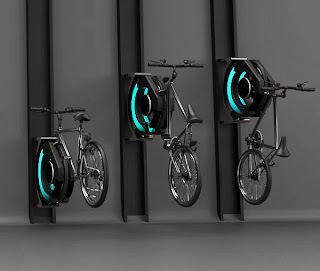 Rekey your own locks on the spot. and project managers to easily manage and secure properties during the different and separate stages of a construction project. 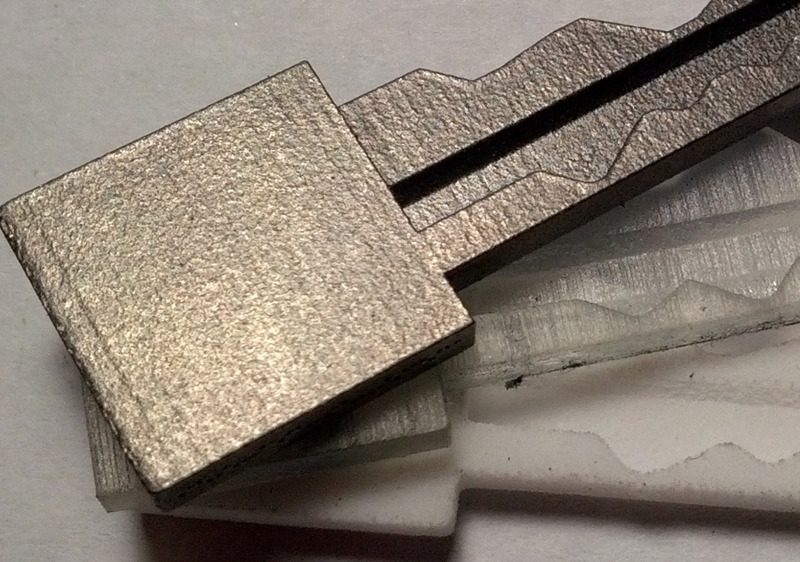 Clearly identifiable keyway inserts matching to respective colored key heads, can allow for secure access to particular trades at particular times. This means that a project requiring electricians access only could, say, be colored RED. Only RED keys will work the required access doors to the project. When the electricians part of the project is completed, the project manager can simply swap out cores themselves to, say, BLUE cores allowing access by plumbers. All others besides the plumbers and project manager are locked out until completion of their works. When the plumbers work is completed, the project manager can then use their core removal keys to swap cores to GREEN cores, say, for allowing access to finish carpenters. All the while maintaining complete and total access control to the project, using conventional mechanical locking products. This directly reduces costs during the construction phase of your project and protects all parties from potential losses arising from unauthorised access. Project managers can then re-use the color coded cores and keys on other projects and if they continue to use the same sources of tradespeople, can easily manage their other projects by knowing which stage each project is at, by the color of the keyhole and reducing costs by not constantly requiring to hand out new keys for future projects. Tony Steward is a very talented colleague from Australia. A master locksmith in his own right, Tony is well respected among his peers as an innovator and technical wizard in the locksmith field. 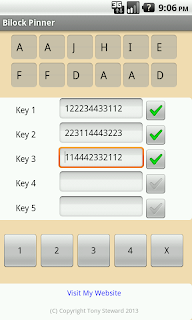 I recently downloaded his newest application for my Android device that helps to design and create simple Bilock key systems. 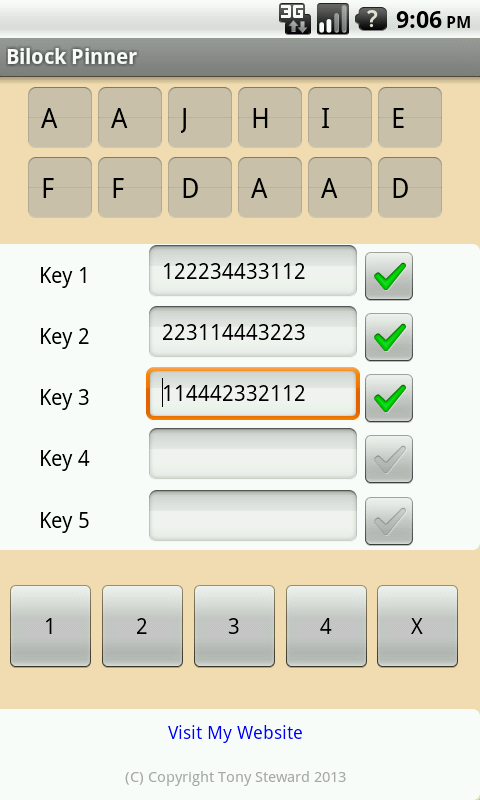 The app is simply designed, easy to use and explains the loadings for each core. Any Bilock dealer in the world will instantly recognize the value in this simple to use application available in the source below. Our extremely popular Lockwood 7444 Keyed Pocket Door Lock is now in stock again. This is the fastest selling product in our inventory. We have difficulty maintaining stock levels because it is proving so popular. 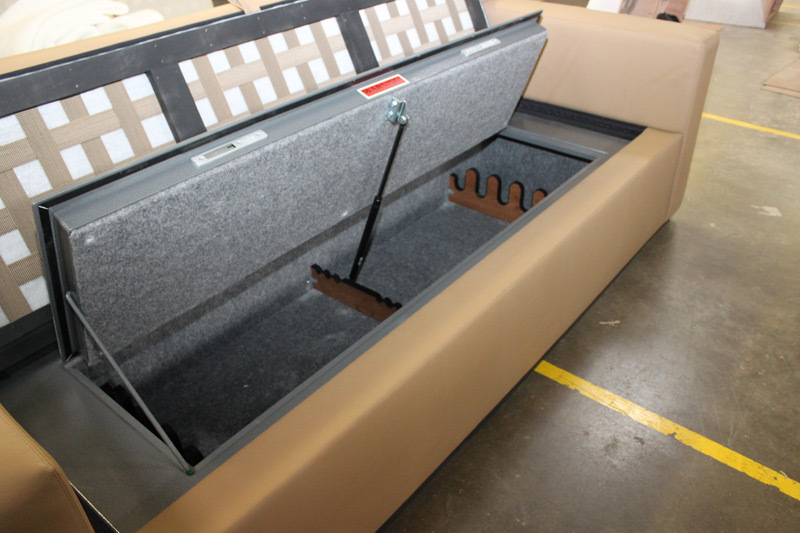 Today (Tuesday, December 3, 2013), we just received our next shipment of inventory, which we now make available. Because this product sells very quickly, we suggest that you get your order in NOW to receive your product before Christmas. In our January order, we are expecting both the 7400 and 7410 product as well. The 7400 is the privacy (bathroom) version, the 7410 is the passage latching version, the 7450 is the passage version.. We will probably only be purchasing these versions in the Satin Pearl (nickel) finish. The link to purchase is in the source below. The Hooply Handle Lock series is a very interesting, functional, secure and modern looking door lock, that might suit the taste of discerning home owners. Hooply products are seen widely in hurricane and weather affected regions of the world. Competitively priced security that looks sensational. More Hooply products to come...stay tuned! 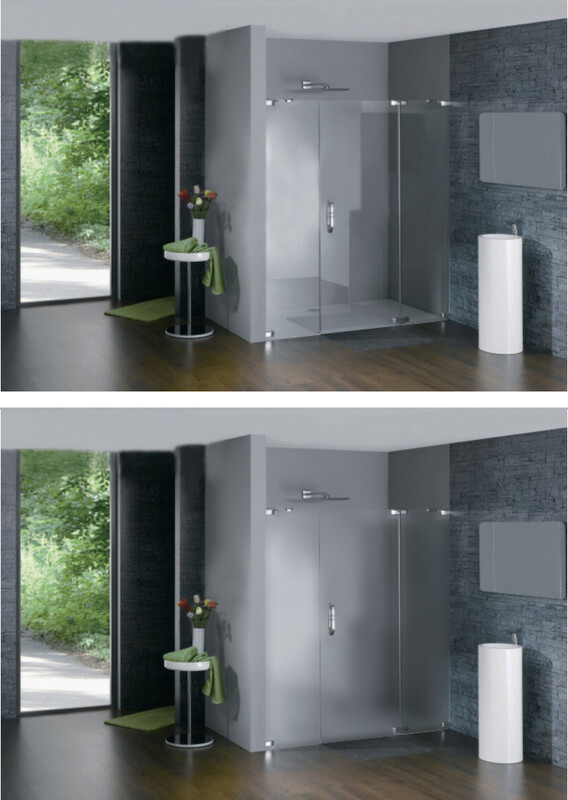 We arrive back today with a truckload of Serrature Meroni Nova style passage, privacy and entrance sets in all the available colors. We also received roses, latches, strike plates etc in different lengths and colors. We also received a quantity of keyblanks. In the boxes are also some glass door hardware designed to work with Meroni products. We will attempt to sort and package the new inventory into our warehouse and enter into our system. We will soon be having a sale special on these products. the items are all brand new, in original packaging. While interstate, we successfully communicated with some customers and a potential supply source of Meroni products for the eastern sea board. We are in the process of constructing new display boards to showcase the Meroni products and expect to make them viewable in a matter of weeks. Stay tuned for more on Meroni! Lockwood just released a new version of the Pocket Door Passage Lock in the 74 series of pocket door locks. There has been justified demand for a version of the passage function to include a latching passage function, where you can have a turn button on both inside and outside that operates a latch to hold a passage door in the closed position. The Lockwood 7410 Passage Latching Pocket Door Lock is now available in North America too. Our Lockwood 7444 Keyed Pocket Door Lock is one of our best sellers. We are now offering a hidden special price on this product. Embedded somewhere in this blog is a special discounted price for this product. Find it and receive a $30+ discount on the regular purchase price (including shipping to the lower 48). Apple's new iPhone 5S has only been out a few days now, but already some enterprizing German hackers have discovered a flaw with the biometric fingerprint access control function. It is no secret that I have mentioned reasonably often in the recent past about the limitations of fingerprint biometrics. A few years ago, I was offering (what I thought was) a brilliant product that used a fingerprint scanner as the access control solution. It turns out that I couldnt have been more wrong. I discovered, through significant trial and error that biometric fingerprint scanners are faulty by design. I think that one of the reasons that fingerprint identification became the rage, a few years ago, was because law enforcement and investigation services have been using the technology for many years to assist with forensic investigations. While it has proved to greatly assist investigators with identifying suspects, the technology must have been misinterpreted when someone thought they could use the technology as an access control solution. The Perko-Power™ R-102 Concealed Adjustable control door closer is, in my opinion, one of the finest examples of the perfect product of it's kind. What a sensational idea! 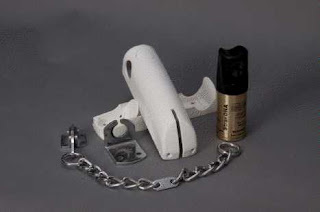 many people really appreciate the benefits of a door closer, especially being able to close a door automatically, but most current products on the market are either surface mounted and bulky and darned ugly or are partially concealed into the top of the door or frame with an arm that extends when the door is opened. Samuel Heath have produced a fabulous product that completely conceals an adjustable power door closer with latching action into the frame side of a door embedded into the hinge side that is 100% hidden from view. This fabulous product should be widely sought after by building companies and door builders who seek to provide their clients with the finest products that minimize exposure, protect patrons/users while providing maintenance free conditions. A great many visitors to this site, regularly search for the the keyword phrase "How To Repair Door Closers". This product is especially designed to enable a door to have the ability to close without the unsightly regard of ugly surface mountings. 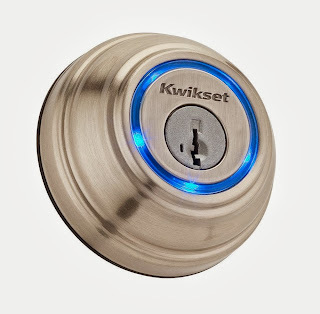 I highly recommend this product to people seeking to improve the ambience of their doors while still enjoyng the ability to close and secure their door. It is designed for wood or metal applications. David-Link are a southern California based company specializing in biometric access control and time clock/employee attendance products and services. 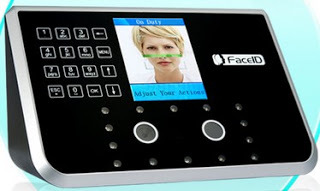 They offer unique branded super-high quality fingerprint readers and facial recognition devices, like the one pictured here. This particular model also doubles as an intercom system, so it's a perfect modern solution for high trafficked environments that may require increased security levels. 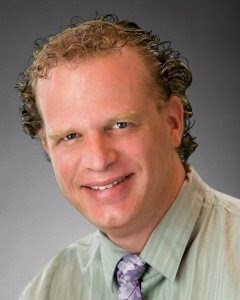 David-Link, established in 2008 are building a reputation for providing cost effective high quality products that dramatically improve business control systems, reduce costs and provide timely and accurate reporting. 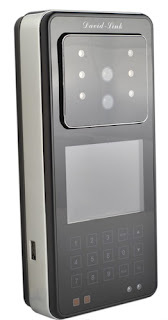 Not only biometric fingerprint time and attendance systems, facial recognition devices, they also introduced a line of biometric safes that are superbly manufactured and competitively priced. They also provide older style time clock systems with employee punch cards. Also among their product line are laminators, designed for office environments. Laminators are often used for making employee identification badges and signs. There are many options available in todays market and separating the wheat from the chaff can be a daunting task. With David-Link at the cutting edge of modern, sophisticated technology, combining with their experience in the time clocks of yesteryear, their especially trained and qualified technicians provide timely support and installations across America. Face ID - The Future Of Access Control Has Started. In December 2009, we wrote an article about this fabulous product and it's infancy in the world of access control. We are very pleased to see it has survived and entered it's teenage years. Hanvon are the brains behind this superbly designed and engineered product aimed at hospitals, research labs, banks and large employers to handle time and access identification of employees. Simple to use, convenient, anti-bacterial, protective and above all else accurate, this product has and will continue to improve our access. Residential and Commercial security products is my main focus in business, but products that provide convenience and security while being aesthetically pleasing is very rare, indeed. The Securemote product by First Watch Security is one such device that is making waves through the residential security market. 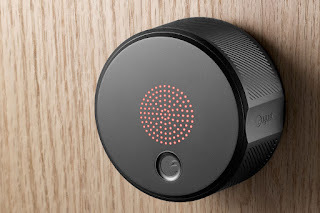 The product is an advanced Bluetooth controller that is designed to connect alongside your existing automatic garage door or gate and provide authorised access control from most modern smartphones. Intelligently designed with the home owner in mind, the product shines where previous entrants failed. View the video after the jump for more information and a simply explained installation and programming guide. The State Of Georgia has imposed a hefty fine against another rogue sheister posing as a locksmith company and blatantly ripping off consumers in the Atlanta and surrounding suburbs. Hot on the heels of that #ABC The Lookout expose, aired on prime time TV a couple of months ago, that showed another rogue trader performing the identical scam, this time the authorities have slapped a noteworthy fine. But, unfortunately he is not out of business completely. He is still allowed to trade, although he has supposedly agreed to make his business practices more transparent. It is most unfortunate that the American consumer marketplace is being attacked by these foreign, often middle eastern people who come here to escape their oppressive and repressive societies. Why do they not try to meld into the fabric of American society? Become honest, hardworking and respectable community members and reap the benefits of friendship and comeradery that most Americans share. 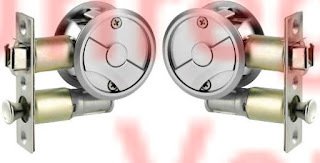 Megamos Cryptology, the science behind the electronic security of transponders for most vehicle systems available worldwide and preferred by many of the larger automobile manufacturers, has been cracked. Scientists from the University of Birmingham, had planned to release their new whitepaper at the Usenix Security Symposium in Washington DC in August until a last minute high court injunction by the UK. Volkswagen, one of the world's largest automobile manufacturers and the principal litigant, claimed the scientific discovery's publication could severely impact the security of vehicles, including four of their luxury car brands, Porsche, Bentley, Audi and Lamborghini. The scientists involved argued that the technology responsible for leading to their discovery, called "chip slicing", has been available on the internet since 2009. Essentially, chip slicing is like reverse engineering technology, which has been used for many years by countries that do not respect patent laws, to build often cheaper, inferior versions of electronic gadgets and sell to the wider markets. The argument, the scientists put forward, that insider knowledge (industry and criminal) of the methods to determine a vehicles security weakness should be tabled to potential buyers and current owners of automobiles, was dismissed by the High Court, who sided with Volkswagen. Mr Justice Birss said he recognized the scientists right to publish, but it will mean "that car crime will be facilitated". The Sargent G1.5 Cylindrical lock is a part of their Profile series of products. The product pictured here is actually the Mortise lock version and is considerably more expensive but the cylindrical version is essentially the same design except the key cylinder overide is in the body of the lever instead of the body of the controller and it uses a standard tubular latch backset. The product has been designed and built from the ground up, in consultation with many school administrators, maintenance and facilities managers and school security experts. Many of these discussions have taken place because of the unusual increase in school related invasions and murders in recent years. The Sargent G1.5 is a hard wired access control product that allows for up to 2000 users. It also has a 2000 event history that can be used for audit trail benefits. There is a data transfer port to enable acquiring audit trail data or installing new access codes. We are the North American distributors for the high quality Serrature Meroni product line, which includes a wide range of nouveau push/pull and press button lock sets that require no twisting of the wrist or clenched fist grasping of a knob or lever to operate a door lock. "Door handles, pulls, latches, locks and other operating devices on doors required to be accessible by Chapter 11 of the International Building Code, shall not require tight grasping, tight pinching or twisting of the wrist to operate." Brinks, a well known manufacturer of light duty security deadbolts, padlocks and entrance hardware recently introduced their new Push, Pull, Rotate line of door entry sets, that are a new take on the successful Meroni product line, available throughout Europe since the early 1970's. Fundamentally different in their design, from the Meroni, these handle sets offer another look at the convenience of the push/pull mechanism but with the addition of a twisting option. 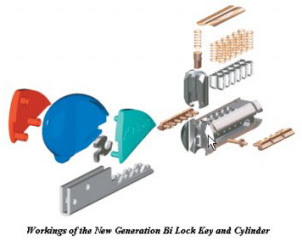 Essentially, Meroni lock sets exceed the International Building Code requirements for entry and egress. The product line is considered in line with Grade 1 hardware found in the USA, although has not yet applied for such status, keeping the product line moderately priced. The Brinks product displayed in the above video is exclusively available at Lowes hardware stores and is relatively inexpensive. 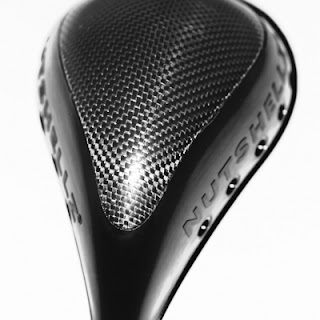 The quality of the Meroni product line is significantly stronger and this is felt in the weight and feel of the product. Meroni products are available in a significantly larger range of finishes and color options. Most municipalities and states and counties have adopted and ratified (or are about to) the 2012 International Building Code, as the core guidelines for construction, renovations or refurbishment of dwellings and public use buildings throughout the world. Compliance to these core principles means that your building contractor accepts and adopts their responsibility for life safety as a fundamental principal in their business. 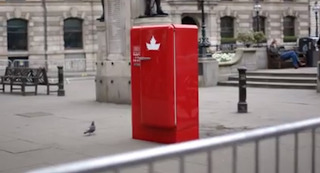 The Molson Brewing Company, a well known Canadian brewer, recently released a novel advertising campaign across Europe to showcase their brand of beverage. 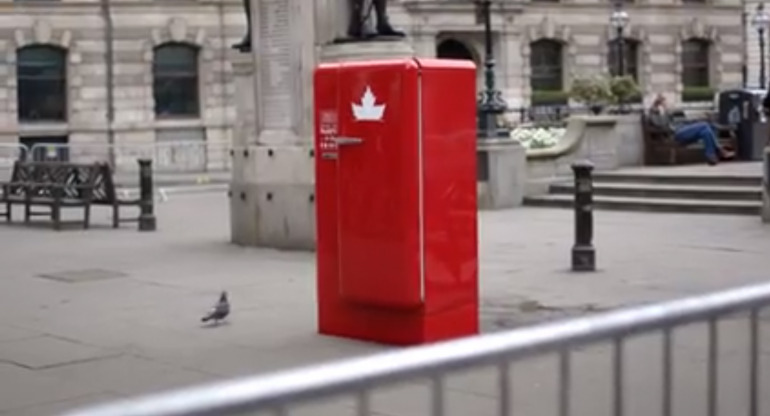 The reason we include it here is because they have designed a fridge that will only open with a Canadian passport. An interesting and novel approach to securing your most prized collection of Canadian lager. The Lockwood 7410 Passage Latching Pocket Door Lock will soon be available in North America too. TThe Lockwood 7444 Keyed Pocket Door LockThis impressive product continues to lead sales in our small company. The obvious reason for leading the market in this product category is it's modern, inexpensive, yet super-high quality design and construction. Installation is super easy, as depicted in the video below. This sought after product is being snapped up by leading hotel chains and office constructors, keen on separating 2 rooms securely while having the advantage of connectivity without requiring two separate doors and frames. ELMES INC. are a Torrance California based importer of specialty and custom designed and built door hardware. 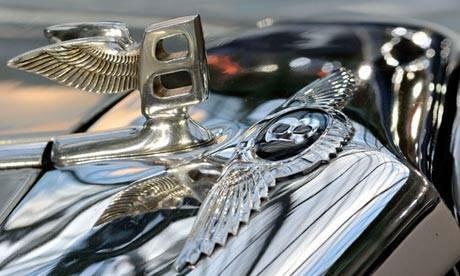 Specifically, ornate and unusual door handles. 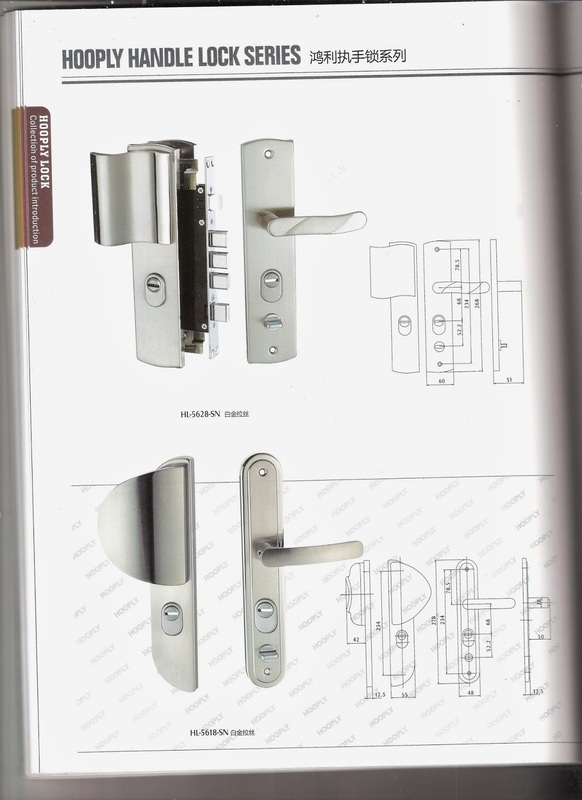 The company was established in April 1997, specifically to introduce the fabulous range of Japanese door hardware solutions to the American market. All of ELMES INC. products are produced by their Japanese parent company UNION Corporation. Attention to detail and use of high-tech manufacturing techniques, separates Union Corporation from other door hardware manufacturers. Catering to the high-end of the market, discerning interior designers and architects are seeking nouveau and novel designs to compliment their many and varied customers tastes and desires. They also sell their products to other than high-end customers, including many leading retail chains found in shopping centers across the world. The custom built handles are very beautifully designed and expertly manufactured to tight tolerances. Unique door handles are often the first item a visitor will see as they enter your property and having something that differs from the norm while being fully functional and aesthetically pleasing, can make your home or office stand out from the rest. Security products often involves not just protection systems designed at mitigating or reducing unauthorised entry. Often safety products are combined with security products to provide products and services aimed at making all our lives safer and more secure. Fingersafe® is one such product designed especially to attach to entry doors (or just about any swinging door) that closes the gap on the hinge side of the door, preventing injury from fingers jammed in the hinge side. Especially produced with a concertina/accordian like design, the product attaches to almost any hinge side door jamb and prevents your child or anyone from a world of pain. Liability costs for business owners are skyrocketing. Awards in the United States have been as high as $750,000 for a child’s amputated fingertip. Retailers, restaurants and child-care facilities are the most common types of businesses at risk. 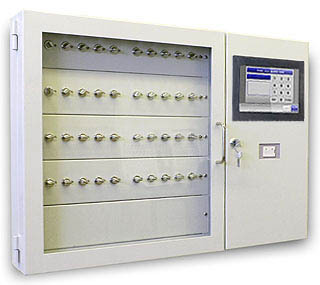 Fingersafe® is Underwriter's Laboratory (UL) approved with a fire rating of four hours. It can be installed on any fire door and has been tested and complies with the following standards: NFPA 252, UL 10B, UL 10C, ASTM E-152, CAN4 S-104, and UBC7-2 (1997). Fingersafe® was awarded a United States Government contract and is the recommended door safety product for US Government and Military child care facilities. Applications for Fingersafe® Door Hinge Guards include schools, youth centers, fast food restaurants, hospitals, ships, factories, universities and churches. More and more standards now require door safety devices in recognition of the need to eliminate this type risk. Fingersafe® is available in White, Black, Brown and Gray and in various lengths. e.g. 80 inches, 83 inches and 96 inches. It can also be produced in additional colors and lengths on special order. We have discussed security film here before and we also sell and install the high quality Shattergard product made by Global Security Products. The Shattergard product is the type of product that strengthens glass windows making them significantly harder to smash, thereby increasing the security of your premises without detracting from the ambience of your living areas. 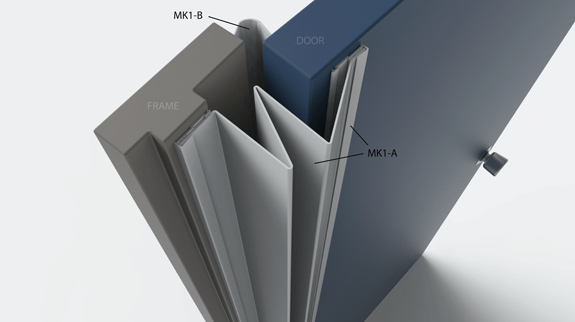 Sonte are a company that have recently introduced a long sought for solution for transition windows. Transition windows are windows that include the ability to alter the opaqueness of the window. This enables you to have a clear see through window and change it yourself to provide privacy. 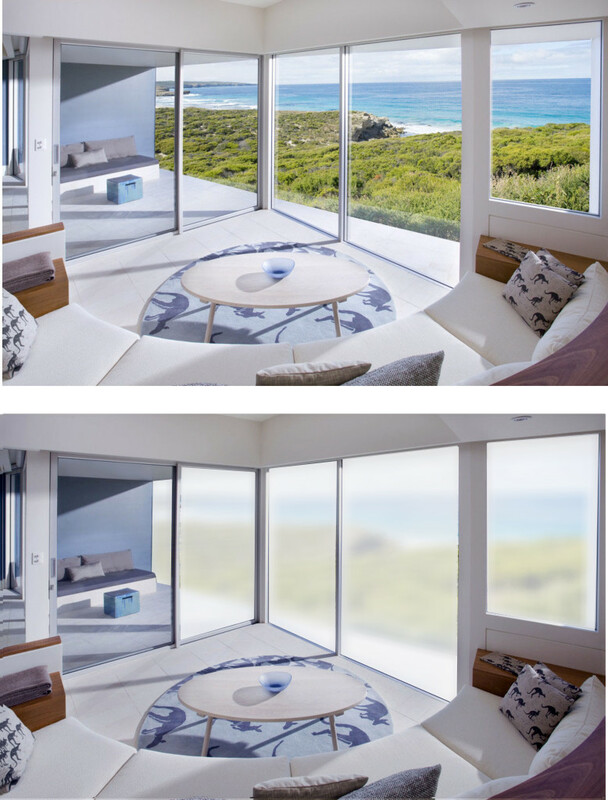 There are companies that make dedicated windows that can be transitioned from clear (see through) to frosted (privacy mode) but they are very expensive and time consuming to install. The pictures here display the difference between clear and frosted look. 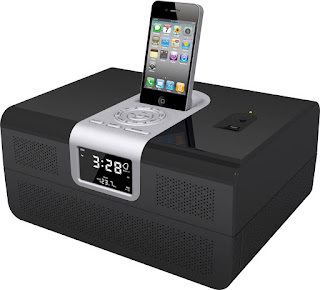 Canon Security Products recently introduced their new Radio Vault, which is a smart looking clock radio speaker system that includes an iPod/iPhone dock, enabling a high quality speaker sound system combined with a hidden biometric vault drawer. We recently discontinued this product line due to the concerns about using a double cylinder product on entry doors. 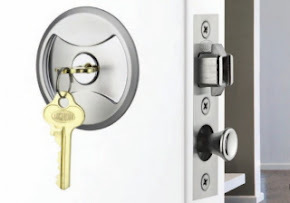 The international building code suggests that the use of double cylinder lock products potentially could cause life threatening issues if someone was accidentally locked inside a room. Life Safety codes in the USA, also require that all door locks require the ability for any person inside to be easily able to escape. We just cleaned our inventory room and discovered (to our surprise) 2 in Satin Chrome and 2 in Polished Brass. We are pleased to make these available to the first people who contact us requesting so, by email. They are $125.00 each + shipping. We just received notification of being a recipient of the 2013 Best Of Home Advisor Awards. We have continued to be a proud member of the Home Advisor (formerly Service Magic) group of professionals. We take this opportunity to thank our customers and clients for nominating us for this honor and pledge to continue offering our services to the best of our ability. The IQ Key management system is a robust and superior key control and access management system similar to the Traka product that is used widely by many automobile dealerships and hospitals. Simple to configure and competitively priced to Assa-Abloys product, the IQ system offers an alternative that concerned security management controllers should look into to compare possibilities. The video (after the jump) shows how simple the system is to use. It includes options for proximity card access and/or PIN access control. This is the August Lock Adaptor. 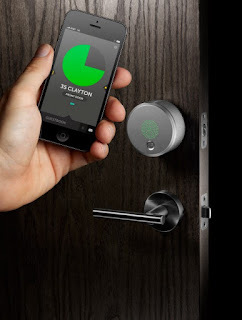 It is a product similar in concept to the Lockitron product we have mentioned before here. This classy looking gadget works similarly to the Lockitron product, using Bluetooth to pair with your selected mobile handset. 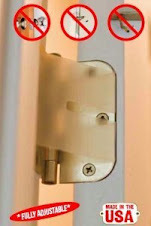 This is an add on product that installs to the inside of your existing deadbolt lock. 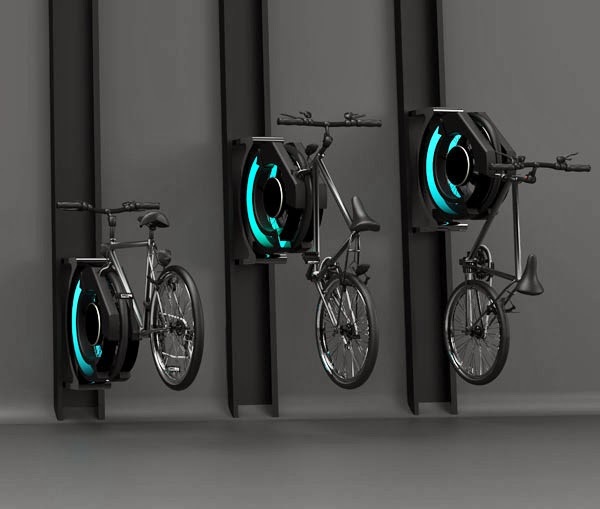 It offers convenient keyless access to your entry. 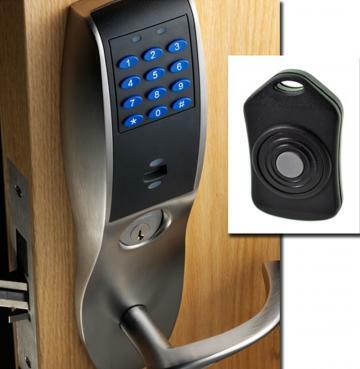 It is designed to work with many existing brands of single cylinder deadbolt locks. Similar to the much touted Lockitron product (which is currently 6 months overdue for release), you simply replace the inside turn button with the August Bluetooth adaptor. The product works just like your existing turnbutton. Here you can see a depiction of what it will look like on the inside of your door. Once programmed, you can invite selected users to use their personal phone to access your door. 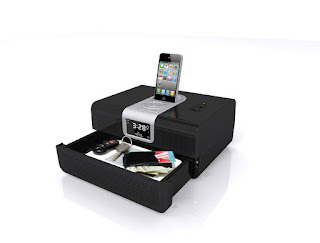 No more handing out keys or worrying about surreptitious duplication. 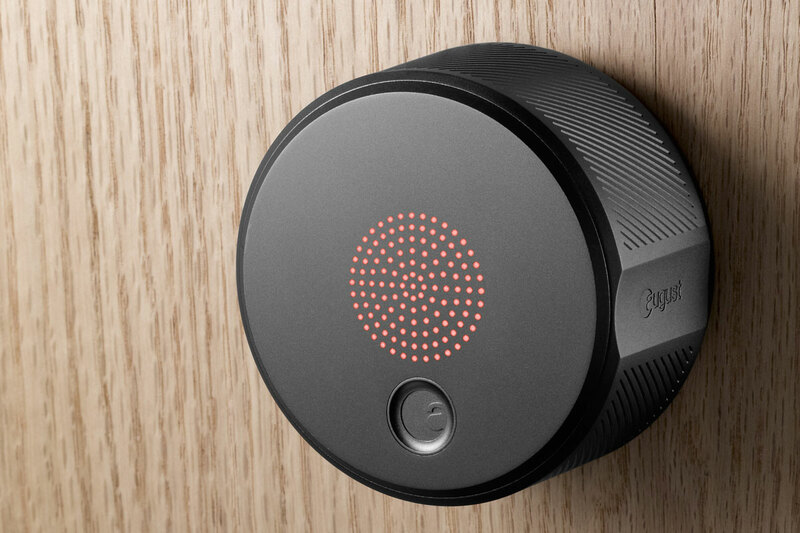 The product uses a proximity sensor to detect an authorised user's presence and automatically unlocks the lock. It is important to remember that this is only designed for the deadbolt. 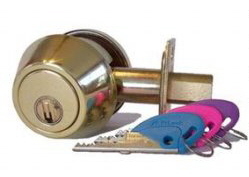 many people also use a locking handle or knob on their entry doors. If you do use a locking knob, the August product becomes irrelevant. Realistically, locking knobs are not a secure product anyway and often the only real security you have on your door is through the use of a deadbolt lock. While the merits of keyless entry are obvious, I think that many people will forget to lock the door as they exit, leaving your property unsecured. Other features of this product include notifications (logs) of entry and exit that you can view on your computer or mobile phone.